A push isn’t an exercise per se but rather a category of movement. It includes the push-up, the military press, and the bench press, all of which are big pushes. Forced to rank them, they’d be ranked in that order: best, better, and still great. Within each category of human movement, you want to do the movements that offer the highest return on investment. The push does that. And the push-up in particular is perhaps the perfect primal exercise, working trunk stability and upper-body pushing strength. This classic gym class exercise strengthens the chest, shoulders, triceps, and abs. When you think about pulling, think about the pull-up because there's nothing finer for a strong and muscular back. Don’t fret if you’re unable to perform even one rep of the pull-up, and certainly don’t listen to the bunkum recently churned out claiming that females can’t do pull-ups. Females most certainly can and most certainly should do pull-ups. Hinging — a movement horribly underpracticed — is a tremendously useful pattern. 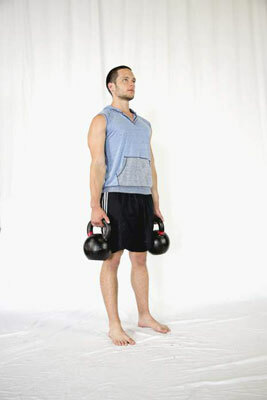 Perhaps the most marvelous fat-chopping device ever seen is the kettlebell swing. Hinging forges an iron posterior and is, or at least should be, the default movement pattern for picking stuff up off the ground. As an athlete, you can produce a tremendous amount of force from a hinge — think of a lineman before the snap, a sprinter before the gun, or a broad jumper before the leap; these actions are all strong and all come out of a hinged position. The figure shows the dead lift, which is perhaps the most common hinging pattern of all. The dead lift strengthens the hips and the back. When performing the dead lift, be sure to keep the back flat and the hips below the shoulders but above the knees. The squat is an essential human movement pattern. Squatting keeps the hips supple and the knees strong. It’s also a natural rest position, meaning that you should be able to get down into a squat and sit there comfortably for extended periods of time. The figure shows the primal or bodyweight squat. If you have the mobility, it should feel almost effortless to sit in the bottom position of this squat. You want to try to accumulate as much time as you can in the bottom of a squat position throughout the day. Doing so will work wonders for your hips, knees, and back. Carrying is a movement pattern that's primal and useful for carrying heavy objects. Carrying, as strength coach Dan John would say, fills in the gaps. It’s something that everyone should do, but most people don’t. Carrying helps reinforce proper posture (which is often neglected) and strengthens the grip (finger and forearm strength is also paid very little attention). Gait, or the manner of moving on foot, includes walking and sprinting. 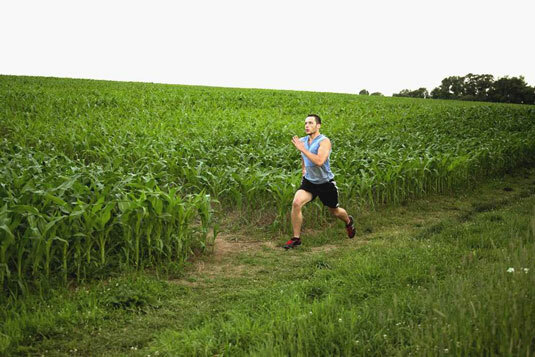 Jogging, especially for long distances, is a dreadful undertaking. Instead, you should steep yourself primarily in the two ends of the force-velocity spectrum. You should move slowly very often and move very fast occasionally. There’s little benefit to playing around in the middle (jogging).